One might have come away from these thinking there is an Earth where rapid progress is being made in building carbon markets and using them to quickly and effectively reduce emissions on a global basis. There may be an Earth which is doing this, but very unfortunately it isn’t this one. It should be, it needs to be, but we have to deal with reality. At the Brussels meeting, Mark Lewis of Deutsche Bank, “laid out a somewhat grim supply-demand picture for the ETS,” Hone writes. 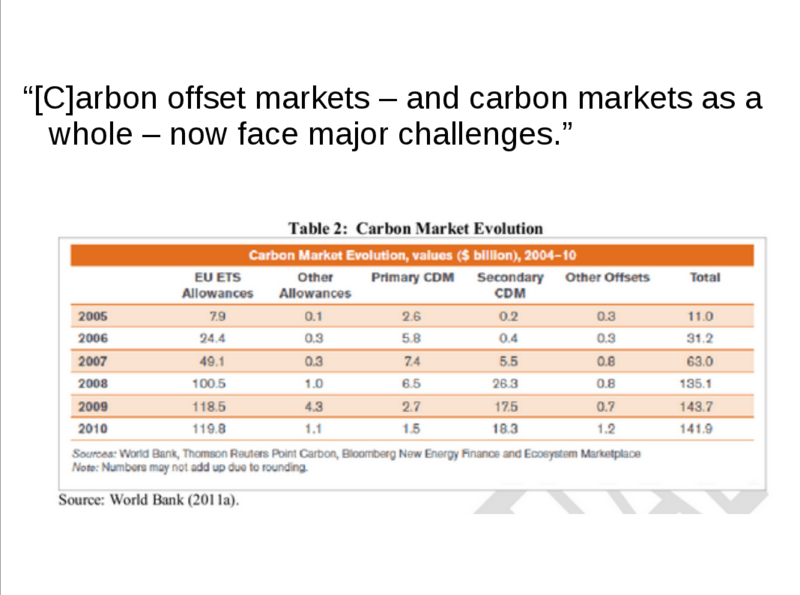 In his presentation, Lewis explained the assumptions and caveats behind Deutsche Bank’s forecasts for future carbon prices. Deutsche Bank does not include the possibility of another economic crisis in their carbon price forecasts. Hone explains that the ETS carbon price “could well remain very weak for a number of years on the back of a long supply-demand position”. Just in case we miss the point he adds, “This is problematic.” No kidding, Sherlock. Here, then, is an edited version of my presentation. The meeting was filmed, and the original presentation is available here, here and here. 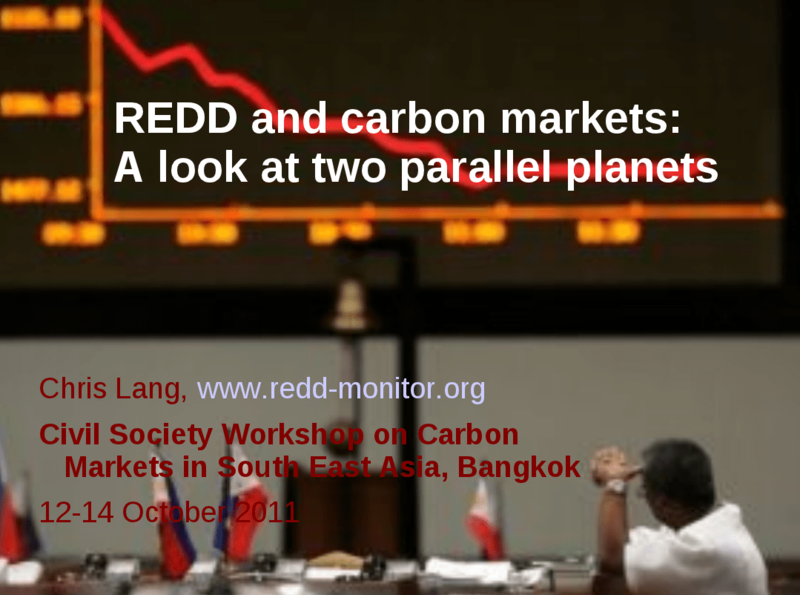 Presentation by Chris Lang (redd-monitor.org) at the Civil Society Workshop on Carbon Markets in South East Asia, Bangkok, organised by CDM-Watch and Focus on the Global South. Here’s the outline: First, a quick look at what REDD-Monitor is. 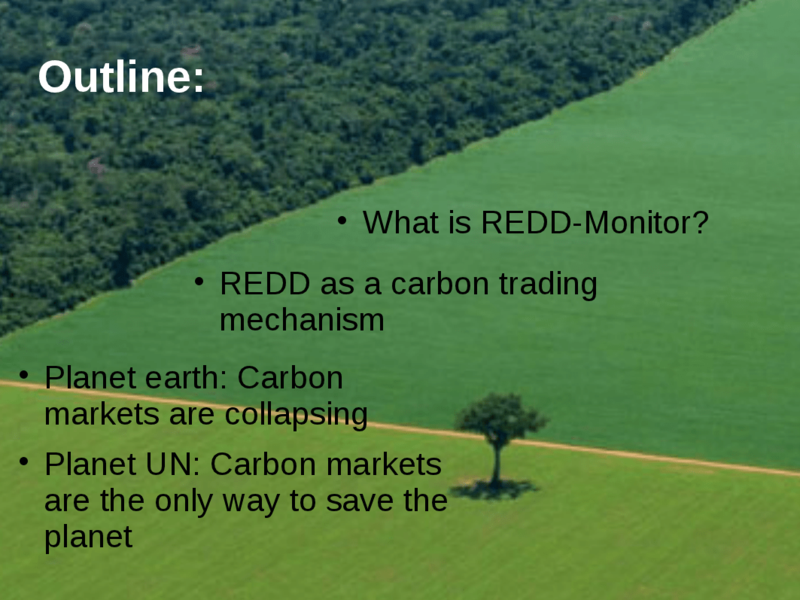 Then an outline of the way that REDD is developing as a carbon trading mechanism. And then the two planets: The first is called Planet Earth where the carbon markets are collapsing, and the second is Planet UN, where the carbon markets are the only way to save the planet. 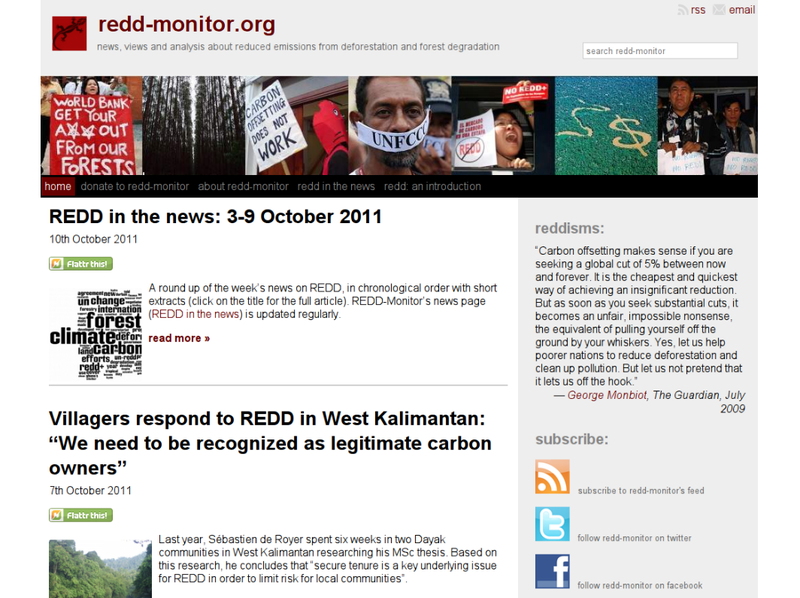 REDD-Monitor is a website, that monitors REDD. I write something two or three times a week, sometimes more, sometimes less. 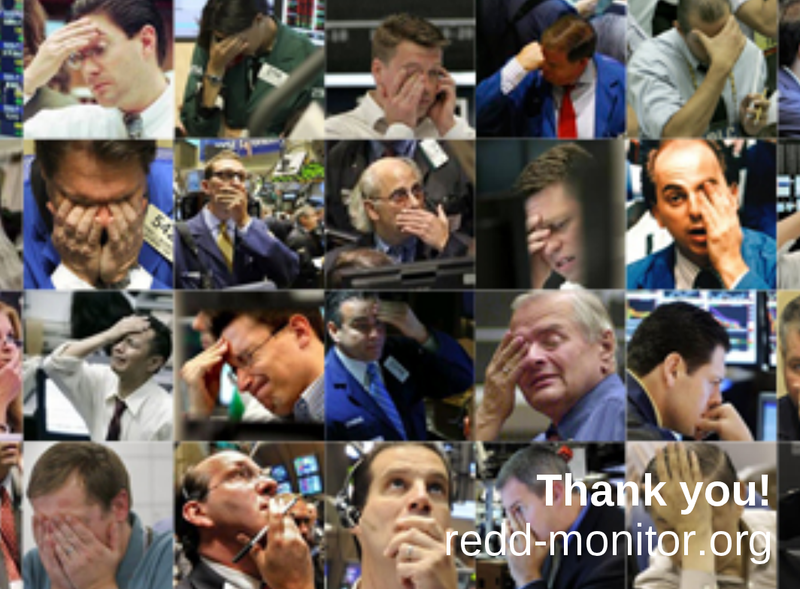 Every Monday I do a round-up of the week’s news on REDD. And during the week, I write posts, based on specific examples from REDD around the world. REDD stands for reduced emissions from deforestation and forest degradation. The idea is to make forests worth more standing than logged. It sounds very simple, but it gets very complicated very quickly. One of the problems is that it’s extremely difficult to measure how much carbon is stored in any forest. It’s also extremely difficult to say what would have happened unless there was a REDD project. Another problem is defining who actually owns the carbon that’s stored in the trees. 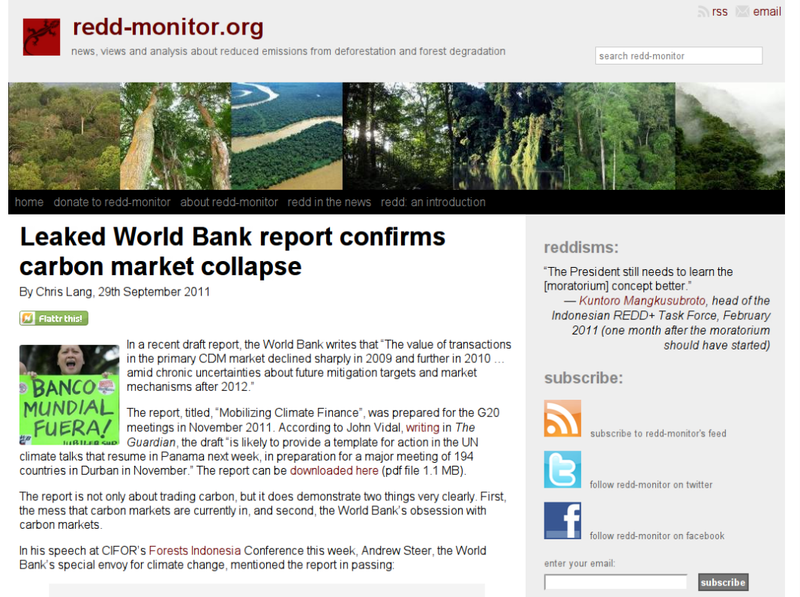 And there are lots more problems, and many of them are documented on REDD-Monitor. 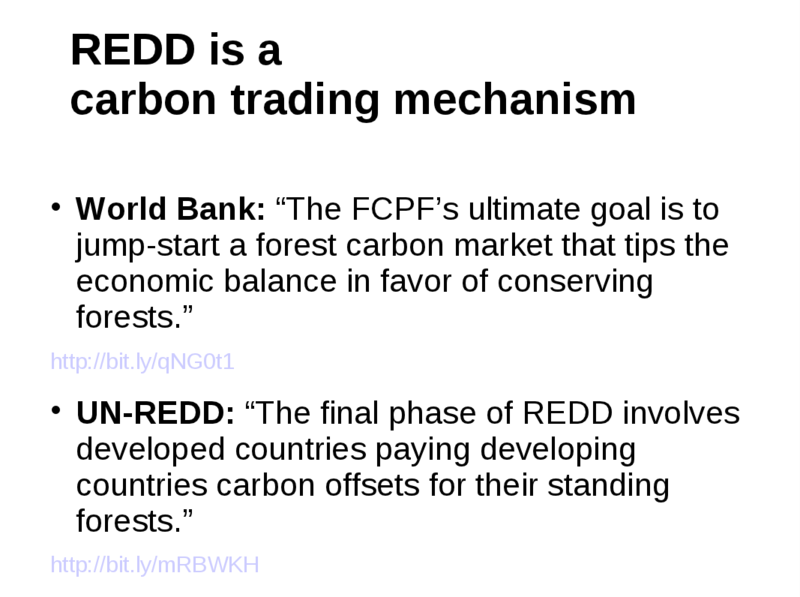 As it is being developed, REDD is a carbon trading mechanism. In 2007, at the Conference of Parties in Bali, the World Bank launched its Forest Carbon Partnership Facility (FCPF). 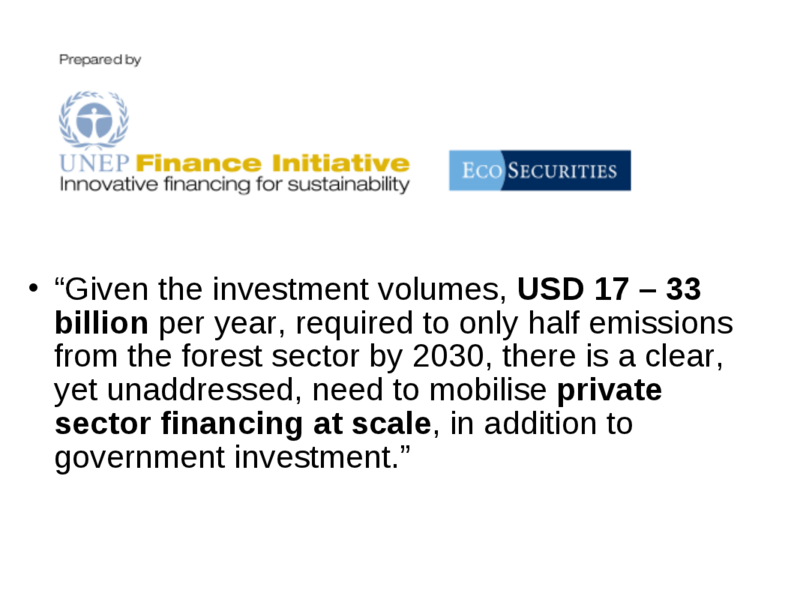 In the press release, the Bank said that the FCPF’s ultimate goal was “to jump-start” the forest carbon market. The World Bank’s interest in REDD is the forest carbon market. 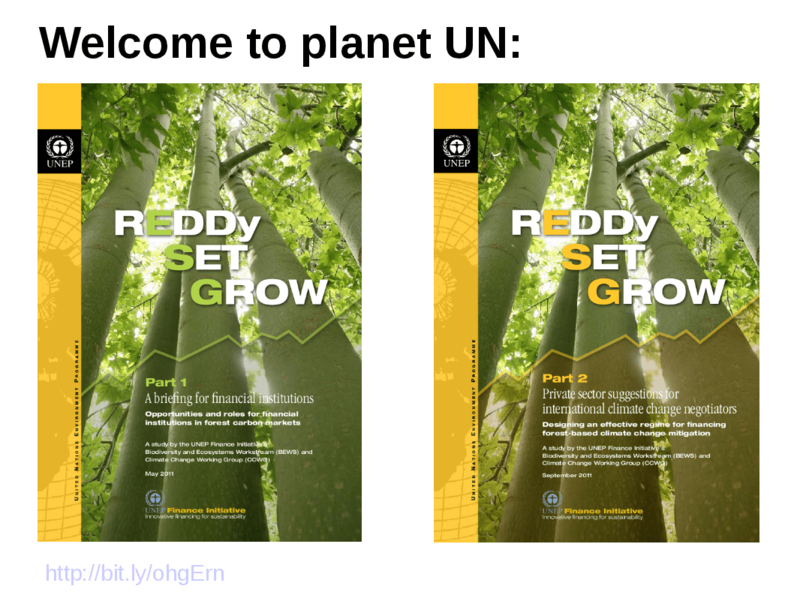 Another one of the main proponents of REDD, the UN-REDD Programme, explicitly states that the final phase of REDD “involves developed countries paying developing countries carbon offsets for their standing forests”. 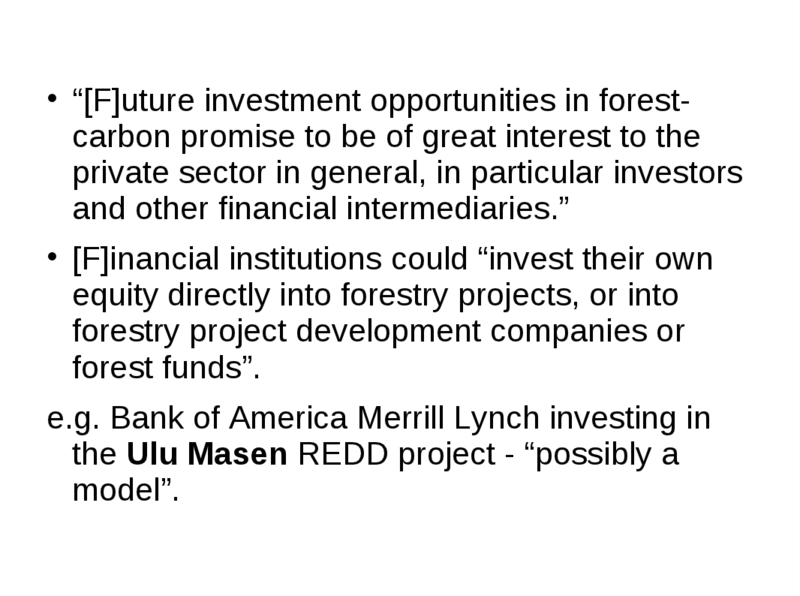 So I think the assumption that REDD is developing as a carbon trading mechanism is a reasonable one. He’s looking forward, no doubt, to buying another Rolls Royce and another yacht. But that was back in 2007. When we look at the actual price of carbon on the European Trading System, things were going OK until July 2008, at which point the price of carbon started falling dramatically. One of the main reasons for this was the economic crisis, which hasn’t gone away. The price of carbon hit a low in February 2009, and it’s kind of staggered around a bit since then. This graph goes to the end of November 2010. The graph at the bottom right hand corner shows that in the last 30 days it’s been falling again. Reuters recently wrote that carbon offsets are “the world’s worst performing commodity”. Clearly, there is little incentive for companies to invest in clean energy when the price of carbon is so low. 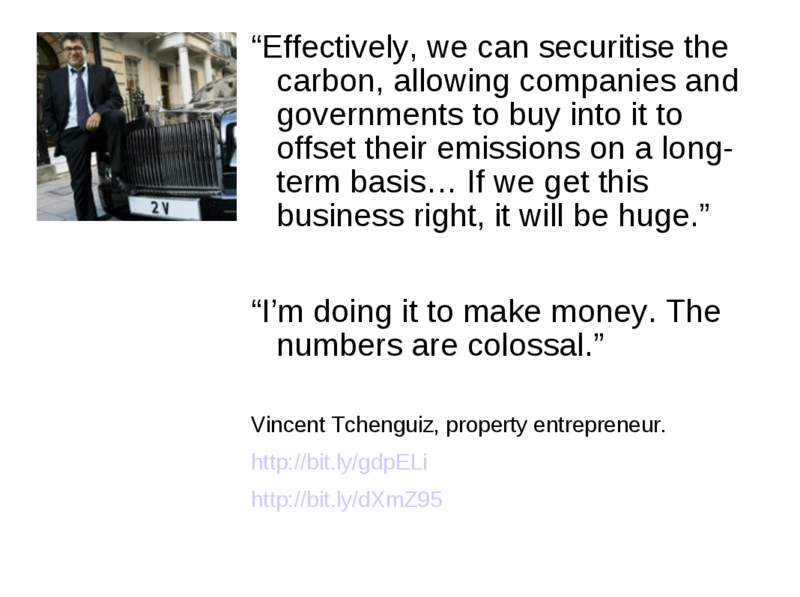 It’s far cheaper to buy carbon credits than to restructure polluting industry. 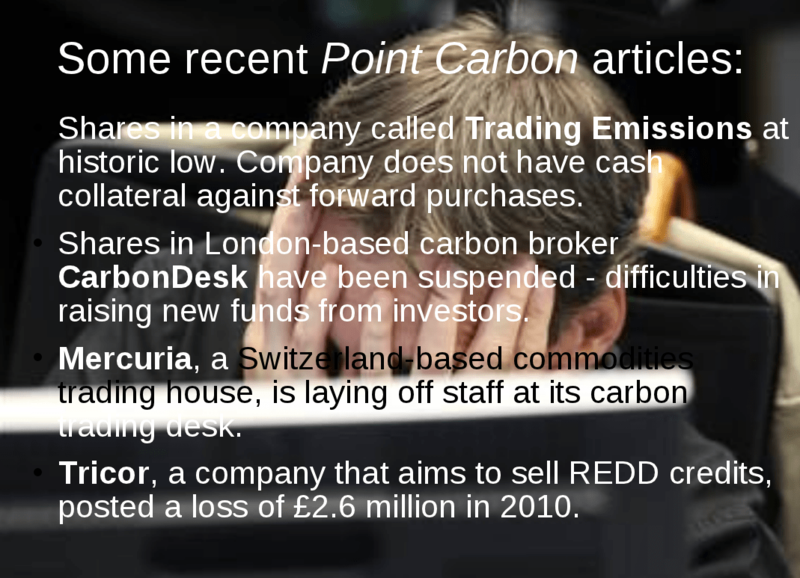 Here are four recent examples of carbon trading companies going bust, or not having enough money to do business, not being able to raise new funds from investors, laying off staff from their carbon trading desks, and one company that posted losses of US$2.6 million last year. 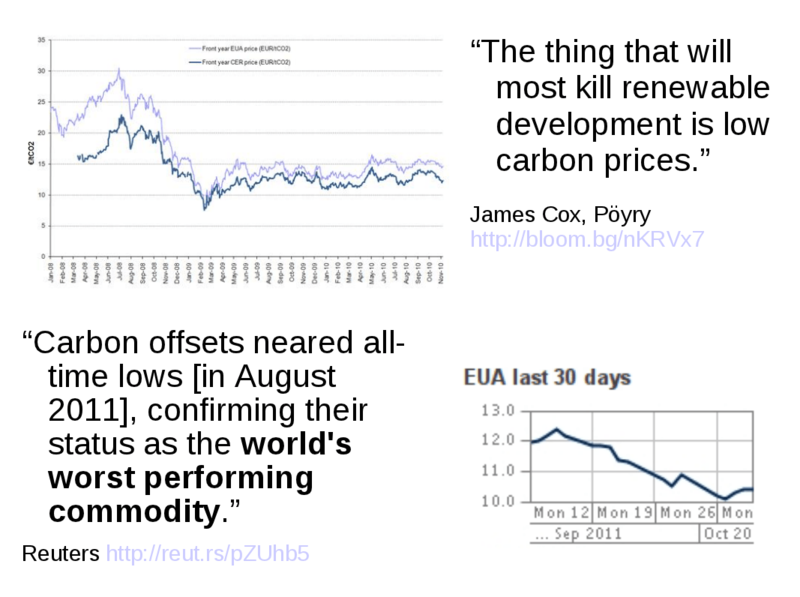 So Reuters described carbon offsets as the worst commodity in the world. The World Bank euphemistically says the market is “facing major challenges”. The figure for sales of primary CDM increased until 2007, but since 2007 the value of CDM credits that have been sold has fallen pretty dramatically from a high of US$7.4 billion down to US$1.5 billion. The figures are even worse than this table indicates. 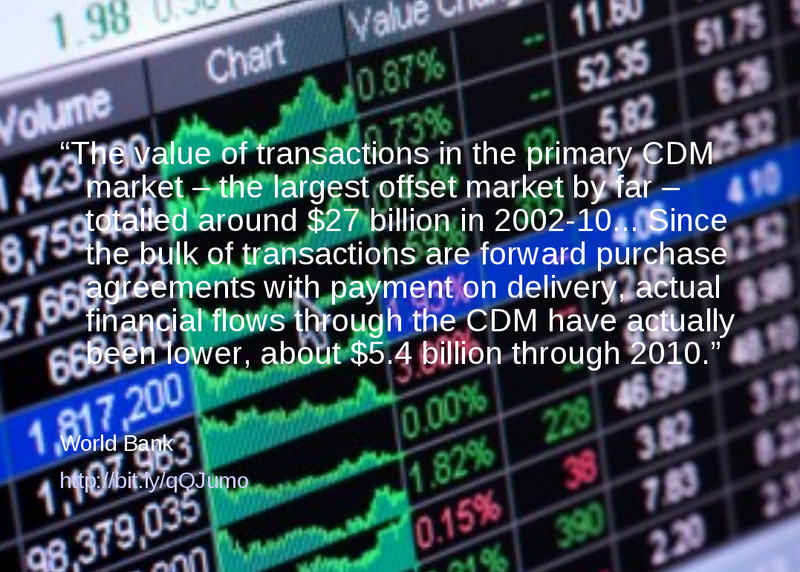 The majority of CDM transactions are forward purchase agreements. Instead of a total of US$27 billion, actual financial flows through the CDM are more like US$5.4 billion. So the actual figure for 2010 is more like US$300 million. OK, so now we move over to Planet UN. 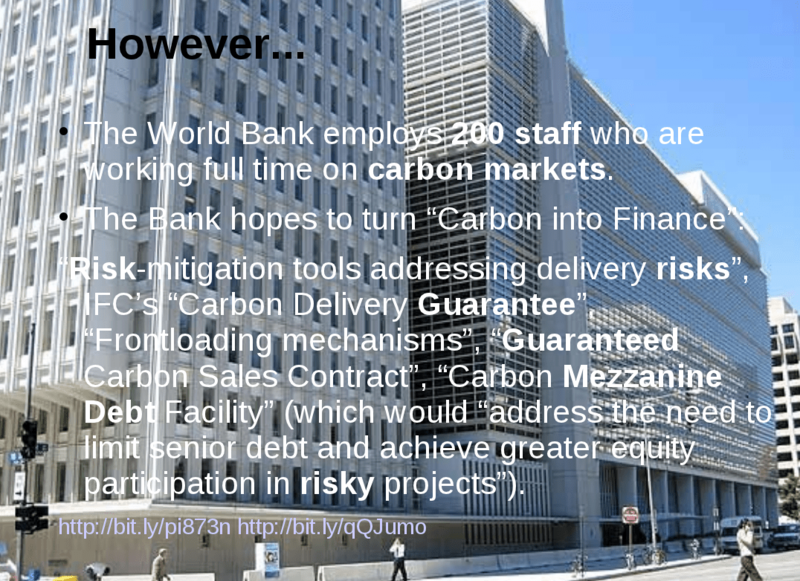 The World Bank is employing 200 staff who are working full time on carbon markets. The Bank is hoping to “turn carbon into finance” and it’s coming up with a series of “innovative financial mechanisms”. You might recognise this phrase from the reporting on sub-prime and the collapse of the global economy during 2008 – it’s precisely this kind of innovative financial mechanism that helped cause the crisis. It’s basically a way of hiding risk. And when you look at what the World Bank is proposing the word “risk” and “guarantee” appears in almost every suggestion. My favourite is the last one: the carbon mezzanine debt facility. The World Bank’s aim is to “address the need to limit senior debt and achieve greater equity participation in risky projects”. Why on earth throwing money into risky projects is a good idea, given the current state of the global economy, I’m really not sure. So far, forest carbon cannot be traded within the Clean Development Mechanism and it cannot be traded on the European Trading System. 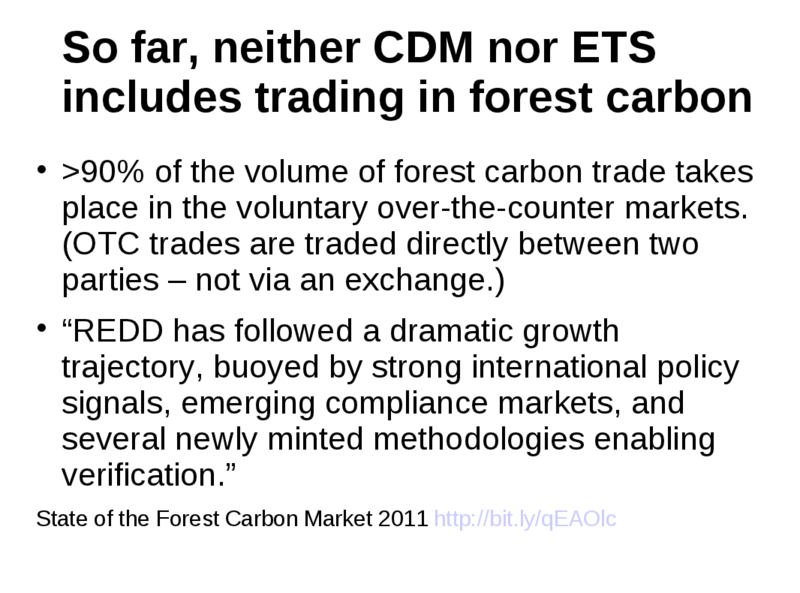 More than 90% of the volume of forest carbon trade takes place in voluntary, over-the-counter markets. And what over-the-counter means is that it doesn’t go through a stock exchange. There’s actually very little specific regulation of what can and can’t take place in that kind of deal. And this is in stark contrast with what the World Bank tells us. According to the Bank exactly what’s missing is strong international policy signals and the Bank says that compliance markets are still unsure. Meanwhile, “newly minted methodologies” translates as a way of inventing new stories for convincing us that emissions have been avoided. 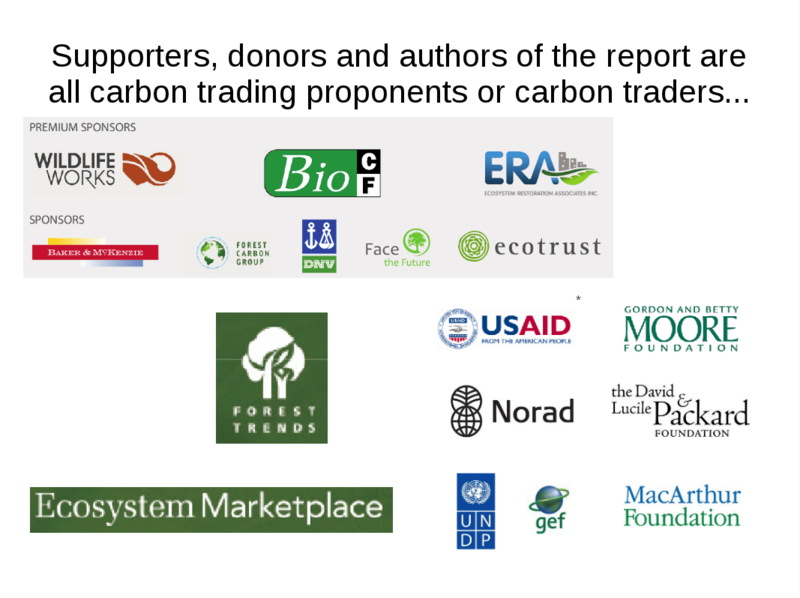 When we look at who wrote this report, and who financed it, we find the World Bank, a whole bunch of forest carbon project developers, Ecosystem Marketplace (which if you’ve never come across them, the name says it all), and then there’s a bunch of funders and foundations who are generally pro-carbon trading. So now we’re deep into Planet UN. If you remember the graph from the beginning of this presentation, the only way to read this graph is by standing on your head. 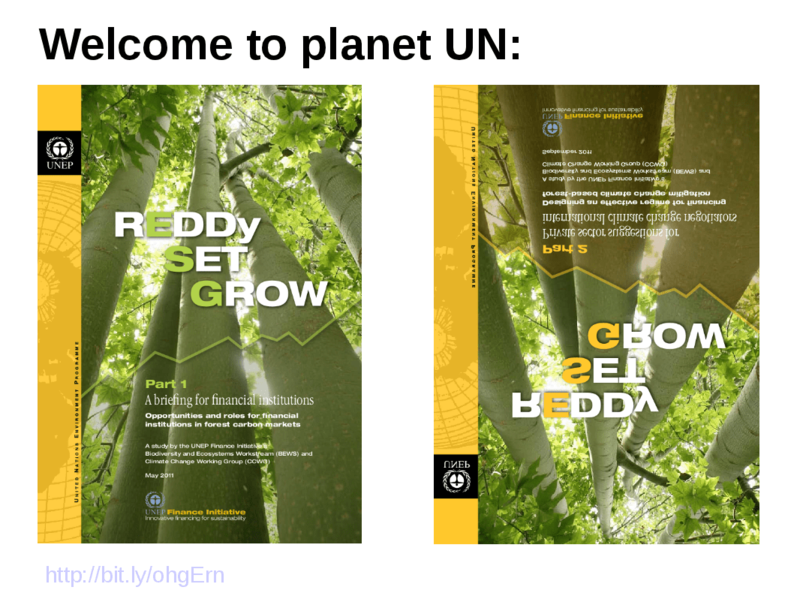 But according to the UN, things are ready to grow. The report was produced by the United National Environment Programme and EcoSecurities, one of the world’s biggest carbon trading firms. The analysis goes like this. In order to cut emissions from forests in half by 2030, we need somewhere between US$17 billion and US$33 billion each year. (Note the wide range of possible costs.) To get this amount of money we need “private sector financing at scale, in addition to government investment”. One of the examples given in the report of this sort of private sector finance is the Ulu Masen project in Aceh province in Indonesia, which the report describes as “possibly a model”. 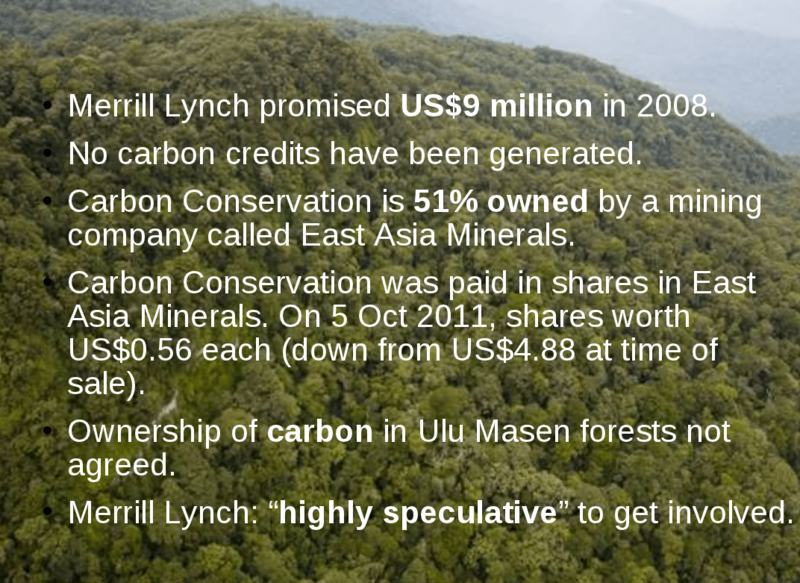 A closer look at the Ulu Masen project reveals that, Merrill Lynch promised US$9 million in 2008, which is hardly a large amount of money, particularly for a project covering 750,000 hectares. The project has still not generated any carbon credits. The project developer, Carbon Conservation, is 50% owned by a mining company called East Asia Minerals. Meanwhile, the ownership of the carbon in the Ulu Masen forests has not been agreed. And Merrill Lynch has admitted that it was “highly speculative” to get involved in this project. 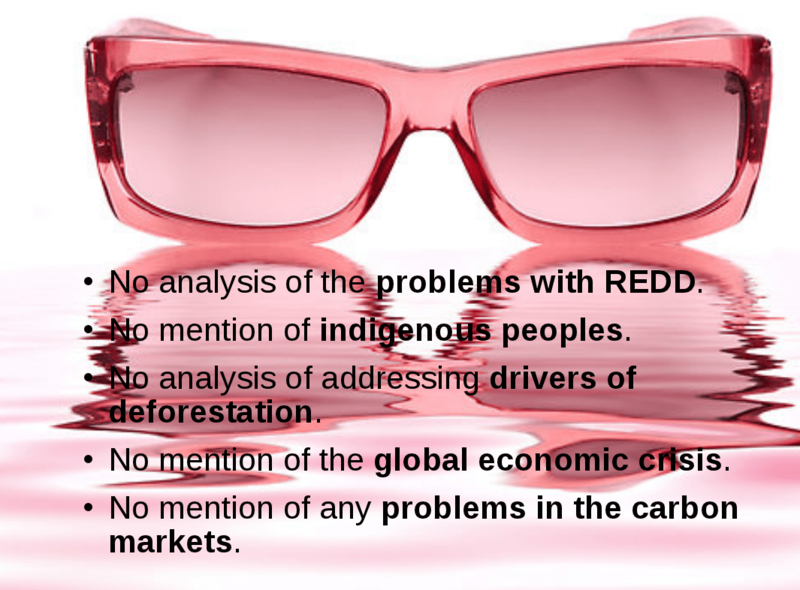 These are the rose-tinted glasses that I believe are issued to staff working at the UN Environment Programme Finance Initiative. They help staff to avoid seeing the problems with REDD and to focus instead on the billions of dollars to be poured into REDD. The report that they produced has no analysis of any of the problems with REDD. It doesn’t mention indigenous peoples. There is no analysis addressing the drivers of deforestation. In fact, that is specifically excluded that from the report. There’s no mention of the global economic crisis and there’s no mention of any problems in the carbon markets. I’ll finish with a quotation from the head of the United Nations Environment Programme Finance Initiative, Paul Clements Hunt. He said this in 2008. 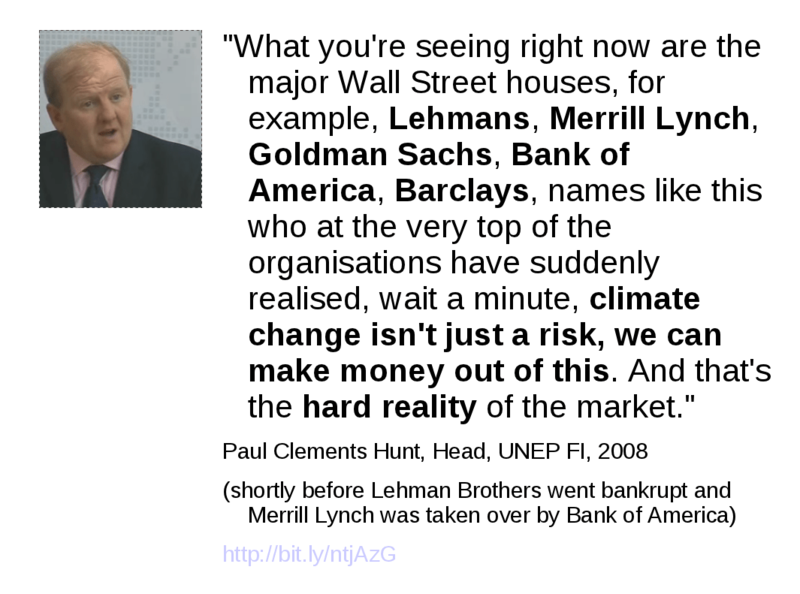 He said this shortly before Lehman Brothers went bankrupt, and shortly before Merrill Lynch was taken over by Bank of America for a very low rate. And shortly before the hard realities of the market brought us to an almost complete economic meltdown. “In order to cut emissions from forests in half by 2030, we need somewhere between US$17 billion and US$33 billion each year.” Really? US$17 billion was similar to the export value of East Asia’s probable trade in Illegal Timber during 2010, and most of this was supplied by two countries – the world’s second and third largest emitters of greenhouse gases (China and Indonesia). The World Bank suggests that governments loose U$15 billion annually in revenue from Illegal Timber. If we stopped buying Illegal Timber, this should greatly help those governments increase national revenue. Conclusion: carbon markets linked to REDD miss the point. The IEA has recently reported that concentrations of greenhouse gases must peak not later than 2017 if we and the poor (not to forget wildlife including forests) are to have a chance of avoiding catastrophic climate change. The largest ever increase in greenhouse gas emissions took place during 2010. Discussion of targets to achieve by 2050 (similarly 2020) tend to miss the point. More imagination (and less dancing to the tune of whoever pays the piper)is needed from economists and governments – not more usustainable economic growth. Leadership is conspicuous by its absence. Which all goes to show that, whilst the financial types that found their way, post meltdown, into the co-called conservation NGOs may have been second-raters, they were still able to convince the financially illiterate, but dollar-eyed, leadership of these organisations, along with the big US Foundations that are funding them, that the carbon market was the way to go. No-one, not the least the US government and UNFCCC delegates, seems to have realised that the big difference between the conservation NGO lobbyists (who have carried on arguing in favour of the market despite all the warning signs), and serious financial investors (who haven’t), was that the former have absolutely nothing to lose, because it is not their money that they are talking about investing. When I see WWF, WCS, Conservation International and TNC stump up $500 million for investment in forest carbon markets, then perhaps I will start believing that they genuinely know what they are talking about.